Much of the attention on treating ulcers has been focused on a new and expensive drug to treat ulcers. While I am not an advocate of treating ulcers with drugs, I am excited to see more focus put on this common condition. As many of my clients know, I put a huge emphasis on the digestive tract for a wide variety of complaints. Many recent magazine articles are discussing specifically ulceration of the equine stomach. These ulcers can be easily visualized with the aid of a two-meter long flexible endoscope. I would like to suggest that ulcers or erosions are just as likely to occur throughout the intestinal tract. Breakdowns in the intestinal lining leads to a serious condition known as leaky gut syndrome. More on that later. The lining of the horse’s stomach is made up of a glandular and non-glandular (squamous) portion. The glandular portion covers the lower two-thirds while the squamous mucosa covers the upper one third. Most ulcer problems will develop in the non-glandular lining because it has little protection against the acid which is produced in the lower portion of the stomach. The exceptions to this are the ulcers caused by toxicity from non-steroidal anti-inflammatory drugs such as ButeT and BanamineT. These ulcers occur in the glandular portion of the stomach because NSAIDs block the release of prostaglandin. Prostaglandin is one of the agents the body depends on to protect the glandular lining of the stomach from the hydrochloric acid and pepsin that it secretes. Both adult horses and foals are susceptible to gastric ulceration. In the adult horse, clinical signs include diminished appetite, colic, frequent pawing, weight loss and poor performance. A classic sign is a horse who eats the grain portion of his diet slowly if at all, but eats hay readily. Horses with gastric ulcers will often be back sore since the acupuncture association point for the stomach is in the muscle adjacent to the spine at the level of the thoraco lumbar junction. Clinical signs in foals include colic, pot bellied appearance, teeth grinding, and excessive salivation. Pastured, grazing horses rarely develop gastric ulcers, however when these same horses are brought into stalls and intermittently fasted they develop ulcers with in five to seven days. Thoroughbred racehorses in training appear to be the most at-risk population, which has led researchers to conclude strenuous exercise may cause a temporary decrease in blood supply to the stomach. Another possible explanation for the increased incidence in racehorses is management. Most racehorses in training stand in a twelve by twelve stall for twenty-three hours a day with little to no contact with other horses. It is also common practice to feed racehorses large portions of grain and a minimum amount of hay. Even if hay is offered free choice, horses will eat less of it if the grain portion of the diet is meeting their caloric needs. It is also common practice to give racehorses frequent doses of NSAIDs both for injury and “prophylactically”. All these factors alone or combined may account for the increased incidence of gastric ulcers in racehorses. Researchers rule out nervous stress as a cause for ulcers, but I disagree. My experience has been that I see more ulcers in horses who do not like their jobs or are challenged beyond their capabilities. Often horses are not overfaced physically but mentally, especially where showing or competing is involved. 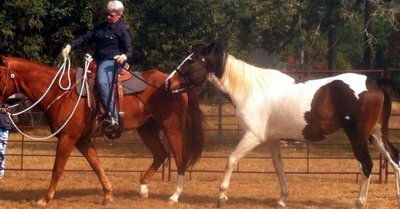 On the opposite side, boredom can create stress in a type A horse who likes to compete. Physiological stress definitely contributes to ulcer formation. Injury or any kind of chronic disease, especially if pain is involved, sets a horse up for ulcers. Conventional treatment for gastric ulcers involves neutralizing the normal stomach acid or blocking its production. I have several problems with this approach. First of all, the problem is not an excess production of acid. Horses produce a small amount of acid continually because they are designed to eat continually. So blocking acid production is a Band-Aid solution when what we really need to do is reevaluate management. Secondly, we are doing the horse a huge disservice by artificially lowering the pH in his digestive tract. The higher pH is harmful to the natural bacterial flora and allows for the overgrowth of pathogenic organisms. This sets the horse up for dysbiosis or leaky gut syndrome. Also digestion is impaired if acid is not present in adequate amounts to breakdown the food. This allows undigested starches to be dumped into the large intestine which has a bacterial population designed for fiber digestion. Ulcers in humans have been linked to the overgrowth of the pathogenic bacteria helicobactor pylori, but so far no specific bacteria have been linked to the formation of ulcers in horses. Instead of chemical protective agents, I use two ounces of an aloe vera gel drink two to three times a day mixed with two teaspoons of ground slippery elm bark. I mix these together in a 60cc syringe and give orally five to ten minutes before feeding. The aloe vera aids in healing of the stomach lining and the slippery elm is a mucilaginous herb which protects and soothes the stomach lining allowing it to heal. I also give SimplexityT blue green algae at the rate of one to three tablespoons, a day to provide additional nutrition and help heal the ulcers. Recognize the horses need to eat continuously. Provide hay free choice and use lower-nutrition grass hay if your horse is an easy keeper. If grain must be fed in large amounts, divide feedings so that no more than three pounds is given at any one time. Match your horse with a job he enjoys and is well suited for. Provide as much exercise and entertainment as possible. Provide Probiotics on a daily basis if your horse is in training or confined due to injury or illness. Avoid frequent or long term use of non-steroidal anti-inflammatory agents.